Time to step things up a notch. 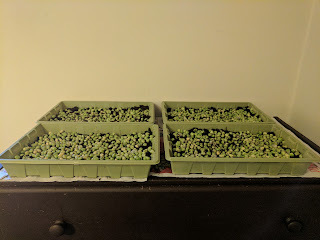 It's looking like covering the pea shoots with soil was the wrong idea. We're four days in now, and there's been very little growth over the last 24 hours. This might be down to other factors, such as growing medium, or whether I applied enough pressure to begin with, or my own needless tweaking and impatience, but in any case, it's time to start experimenting properly. 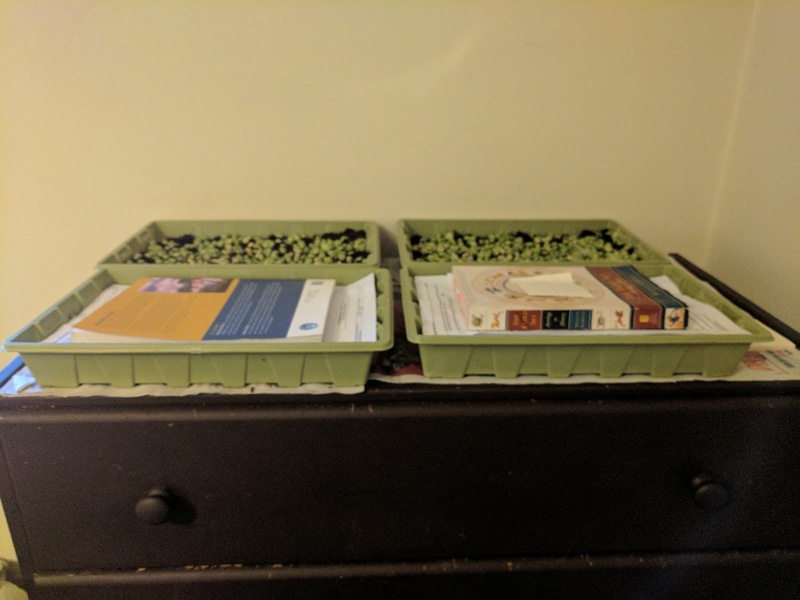 Four trays fit very nicely on top of my bedroom chest of drawers. Out of curiosity, I've used Wilko's 'dehydrated' compost (it comes in a bag, to which you add water, and the compost then expands - much easier to carry home and cart upstairs) in two of the trays. 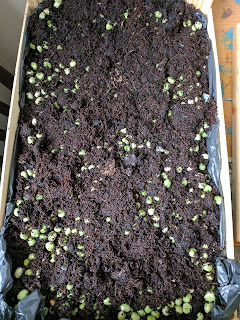 In another, I've used a mixture of my own compost and the Wilko stuff; and in the fourth, my own compost. I tested my own compost the other day, and though it's still very nutrient rich, the pH is quite high too. The Wilko stuff has tended to have a lower pH, even though it seems pretty light on other nutrients. So it will might be interesting to observe how this effects growth, if at all. 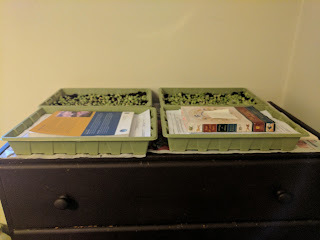 I've also weighed down two of the trays, and left the other two exposed, to see how much of a difference that makes to germination. Starting to feel very scientific about all this; it's nice. 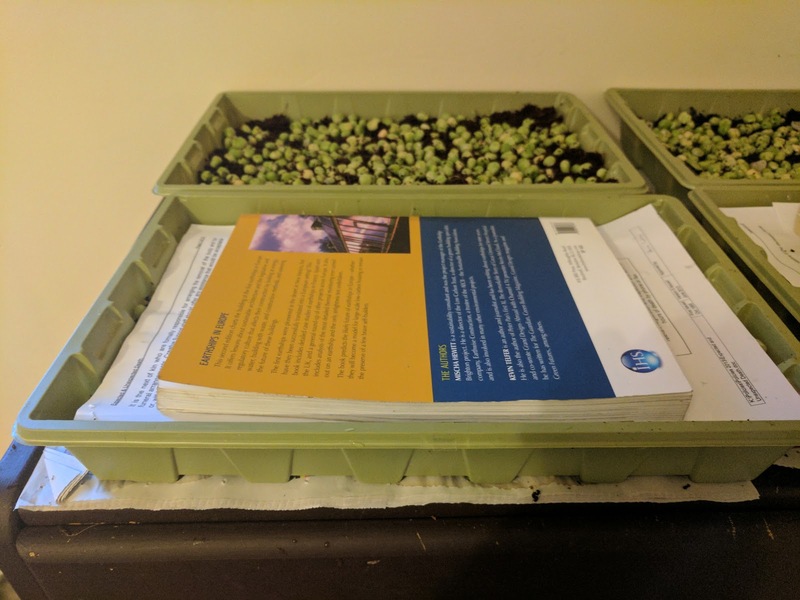 A couple of pieces of A4 paper (blank side down - don't want ink leaking into the soil) weighed down by a book should do the trick. 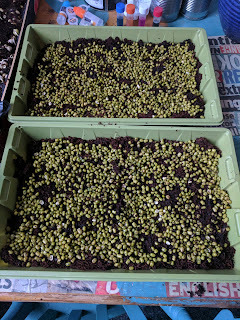 As for the mung beans, these are new, so I've made up two trays and left them exposed for now. I used a 'half-and-half' mixture of my own compost to the Wilko variety. All very pleasant. I'm away overnight, so might not be able to post an update until Friday morning. Looking forward to it already. Doesn't mean I won't be blogging about other things, though. Lovely weather we're having, isn't it?